“I want to bring you into my confidence to tell you what will happen if day zero arrives. Dam levels must at least be at 13.5%. If they go below that, that is the day we will turn off the taps. 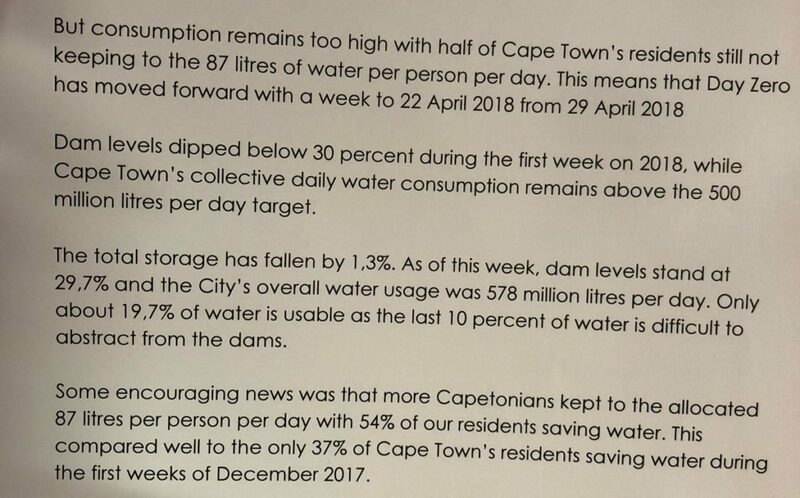 Writing for the on-line magazine The South African, journalist Tom Head reported (9 January 2018) that by January 14th “there’ll be less than 100 days left until the taps are shut off” in Cape Town. The crisis has been brewing for some time and warning, until recently, having been falling on deaf ears. However, the situation is now reaching critical point and it appears, residents are beginning to wake up and limit their usage of water. However, despite an improved water consumption rate in the region, Cape Town is being choked by its dwindling supply left in the dams. That’s according to the Mayor of Cape Town, Patricia de Lille, and the Western Cape government, who have brought ‘day zero’ forward by a week. When will day zero hit Cape Town? In the statement tweeted by Western Cape’s government, Patricia de Lille confirmed the dam storage numbers we reported earlier on Tuesday. Capacity is now lower than 30% (at 29.7%), indicating a 1.3% decrease from last week’s numbers. However, Mayor de Lille did acknowledge those who have been fighting tooth and nail to save every possible drop of water. She stated it was ‘encouraging’ that more individuals are sticking to their personal usage targets of 87 litres per person, per day. In early December the City of Cape Town insisted that there will be no ‘day zero’. But with dipping dam levels, scorching temperatures and incoming tourists, a few folks are getting pretty nervous. What might Day Zero look like? What would Day Zero actually look like if such were to happen? What might happen? It’s likely to be a gradual process, but the South African magazine, Bloomberg, interviewed some who offered insights. Bob Scholes, a professor of systems ecology at the University of Witwatersrand in Johannesburg, had this to say. Clem Sunter, an independent scenario planner who has also been advising the city, meanwhile, painted a grim picture. At current levels, estimates put Cape Town as ‘safe’ until the end of April 2018. This is when the dam levels will reach 10% if current usage continues. With the next rainy season still months away, residents are constantly reminded that they need to do absolutely everything to save water. TimesLive reported in November that people will have to make do with 25litres of water per day for washing, cooking and personal hygiene if dam levels drop below 13.5% in Cape Town. Back then, mayor Patricia de Lille described what Day Zero will look like.